The American Human Rights Council (AHRC-USA) joins the nation and peace-loving people worldwide in observing the 17th. Anniversary of September 11, 2001 terrorist attack. AHRC -USA notes that the threat of terrorism, extremism, hatred and violence continues to exist nationally and in the rest of the world. All advocates of human rights honor the memory of the lives lost. It is a day to remember the national tragedy while engaging in civic and educational activities. In response to hate and ignorance, we advocate for staying faithful to true American values, religious and cultural coexistence, and diversity. Our commitment to defending and respecting human rights and human dignity should remain unshaken by the heinous attack. We stand against the voices of intolerance, acts of hate, violence and terrorism locally and internationally and animosity that seek to divide. AHRC affirms that safety and human rights are compatible, and indeed, respecting human rights promotes security. As Americans, we should strive to be both secure and free. Many states and localities have been using the anniversary of the September 11 attacks as an opportunity for positive, constructive activities and programs by recognizing Patriot Week. 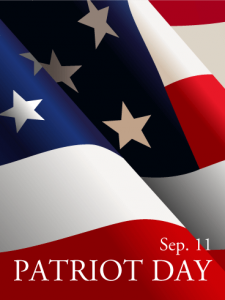 Patriot Week begins on September 11 and ends on the key anchor date of September 17, the anniversary of the signing of the Constitution (Constitution Day) as the anchor dates for Patriot Week. Patriot Week renews America’s spirit by deepening the appreciation of the First Principles, Founding Fathers and other Patriots, vital documents and speeches, and flags that make America the greatest nation in world history. Many of our current holidays have become overly commercialized or have lost their deeper meaning. We need to invigorate our appreciation and understanding of America’s spirit. The schedule for each day has a separate focus. Co-created in 2009 by Judge Michael Warren and his then 10-year-old daughter Leah, Patriot Week has captured the imagination and support of citizens across the nation. AHRC-USA supports Patriot Week and encourages its friends and supporters to partake of the Week’s activities. Patriot Week renews America’s spirit and commitment to its core values of freedom and equality for all by celebrating the legal and political traditions that make America the leader of the free world. “We urge everyone to observe Patriot day by attending the many activities scheduled and by volunteering,” said Imad Hamad, AHRC Executive Director. “Terrorism is a challenge at the local, state, national and international level,” added Hamad. “It is our collective responsibility, all of us of all backgrounds, to make sure that our country is free and safe,” concluded Hamad. Patriot day and week serves as a constant reminder that terrorism, extremism, and violence are our common enemy. In response to hate and ignorance, we advocate for staying faithful to true American values, celebrating religious and cultural coexistence, and diversity. On this day and every day, we stand against the voices of intolerance, acts of hate, violence and terrorism, locally and internationally. “The aim of the 9/11 heinous terrorist attack was not only to harm the immediate victims but to divide Americans as well and spread the false message of a war between religions and a war between civilizations” said Imad Hamad, AHRC Executive Director. “Terror, regardless of the pretexts advances, has no religion or nationality or civilization. Our nation is stronger in embracing and honoring diversity and human rights for all,” continued Hamad.